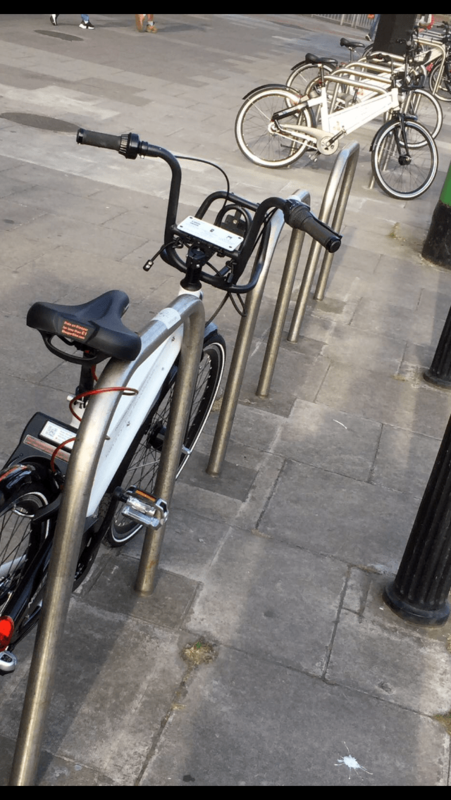 Boundaries of bicycle share in Dublin have been broken by the city’s first stationless bike share scheme, which use smartphones to unlock bicycles. 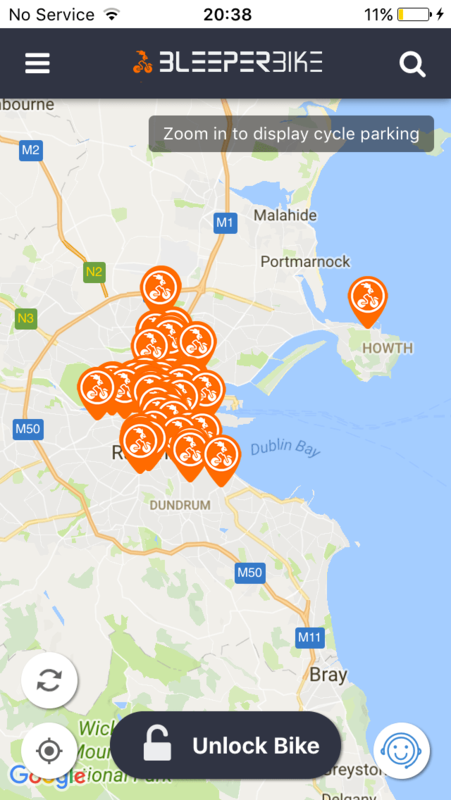 The companies increased the number of bicycles on the streets of Dublin today, with around 100 bicycles currently shown up on the company’s app as rentable dotted around Dublin from Howth to Inchicore to Mount Merrion. Bleeperbike had a test launch late last week with around 25 bicycles put on the streets before it postponed its full launch last Sunday, after the council wrote to them on Friday evening. This afternoon the company added to that number and now has around 100 bicycles on Dublin’s streets. It expects that figure will increase to 1,000 bicycles. Hugh Cooney, CEO of Bleeperbike, told IrishCycle.com this evening that it has yet to meet with the city council over the issue since their wrote to him last week — on Monday the city council were not available and he is unsure if a meeting planned for later this week will go ahead. The company has launched with a price point of €5 for five rentals or €25 for 27 rentals. Both of these options are pay-as-you go and each rental is for up to an hour. Bleeperbike also plans to launch a €5 day pass and a commuter option which give you two rentals of up to an hour a day for €75 per year. To try to avoid the issue of poor parking which has plagued similar bicycle share schemes in China, Bleeperbike users must use official bicycle parking stands. Users are asked to report poorly parked bicycles and the company will also have staff members patrolling the city to remove bicycles causing obstructions. Cooney said users will be warned if they are found to have poorly parked and their access will he suspended if they continue to park in such a way. Bleeperbike is just one of a number of companies looking at bicycle share in Dublin, it’s our understanding that others have mix feeling about the city council’s suggestion of a trial outside the city centre, but the other companies seem happy for the city to regulate at least some parts of the bicycle sharing schemes. The city council said that the Bleeperbike launch was “premature pending the preparation of bye-laws” and that it bypasses “full engagement” with the council and “may secure an unfair advantage over other potential operators who are prepared to work closely with Dublin City Council.” It said that the bye-laws will likely require operators to apply for a licence to operate within the city. How far out can these things go? Will be interesting to see what happens. I understand the reasons behind DubCityCo decision to want the bikes to be fit for purpose and well maintained. Regardless of that particular issue, we definitely need far more bike locking facilities in Dublin (and around the country). And some high-quality ones like they have in the NL wouldn’t go amiss either. These bikes are already popping up at popular bike parking racks, taking up space that would otherwise be used by other cyclists. Wouldn’t want the limited bike parking in the city to be flooded with these bikes share bikes. I would think that DCC is conflicted given Bleeperbike will compete with DublinBikes. If the council had expanded the service as planned, there would be need for a private operator. They should look at the opportunity here to expand shared bikes to the suburbs, with no capital spend from the taxpayer. I expect JC Deceaux will be upset too. It’s a hard one for the privatization-luvvie Fine Gael thinking of the moment. DublinBikes has become unfit for purpose as it was starved of funding and couldn’t expand fast enough for demand; now a private company is offering a model that will fill demand (subject to decent parking infra). Hmm, what to do?